Does My Jade Bangle Have a Crack? When I shop in the jade market, I am very careful to inspect each piece of jade before I make the final "deal". I not only look with my eyes, but also feel each piece with my fingers. The jade sellers often have lights and filters to help customers carefully inspect each piece. Jade is a natural mineral and isn't "perfect" like man-made products, or "fake jades" can be. When you look closely at jade, you will see a lot of interesting things, which is as it should be. However, many customers want their jade to be "perfect", so that's what I try to purchase. The jade sellers in the Chinese wholesale jade markets don't speak English, and I speak very little Chinese, so discussion is quite limited. When I see a jade bangle that has a line in it, I usually set it aside and don't consider it. 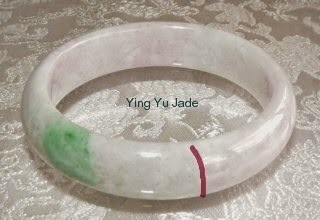 However, the jade sellers want to know why I don't want it, and when I point out the line, they point to the "veins" in the arm to indicate that it's not a crack, rather it's a vein, naturally occurring in the jadeite and not considered to be damage, and will not affect the durability of the jade piece. The Chinese people cherish these veins because it's "proof" that the jade is genuine and natural, "A" quality jade. The jade market is chaotic, and I don't inspect with a loupe or magnifying lens. If you want to find a minor imperfection in jade, if you look hard enough, you will find it. And that's not what is important about jade. What's important is that it looks good, and is the quality of jade that it's claimed to be. So if you don't want a mineral with minor imperfections, you won't ever be happy with genuine natural jade and jadeite. There's a Chinese saying "even jade has flaws". So what's the difference between a jade crack and a jade vein? I always say that I sell only the kind of jade I personally would wear, and I wear jade with cracks often. I can honestly say that I have never had a cracked jade bangle bracelet break because of the crack. So I do sell jade bangles with cracks in clearance section. You can get a great deal on jade with veins, cracks, chips or imperfections that are not real damage in the clearance section. .
Jade bangle bracelets with veins can be in any price range. 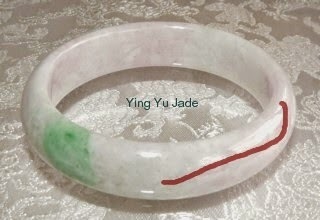 The beautiful jade bangle with imperial green veins in the photo on this page has a vein, but the value is $8000. The value comes from the imperial green color, the lavender hues, the "flower" pattern of the natural jade stone. If I sell it for $8000, most people who pay that much will want a "perfect" jade bangle. And here's a secret that people who really "know" jade will understand: this jade bangle with its vein is a most perfect jade bangle bracelet. It's 58mm and 13mm wide, so too large for me, but an example for me to show people when I discuss jade what a perfect jade bangle should look like.